The Aryan race warrior. A Mexican drug lord. A Korean hit man. A career stick-up man.The wrong guy at the wrong place at the wrong time.The puke Cho-mo-kiddy-toucher.And you!This ain’t the Breakfast Club and these are ain’t your new friends.Welcome to the Protective Housing Unit (PHU), home to some of world’s worst criminals—many of whom so reviled they must not only be shielded from the American public, but the general prison population. This is your new life.Simon, a white-collar criminal, is a new transfer to Pensacola Federal Prison Camp. He’s having a hard time adjusting to prison culture, and his newfound “friends” aren’t all that interested in making his new life any easier. Everyone in the PHU has his own agenda; alliances are, at best, temporary; and even the notion of friendship is laughable. But all that is about to change. 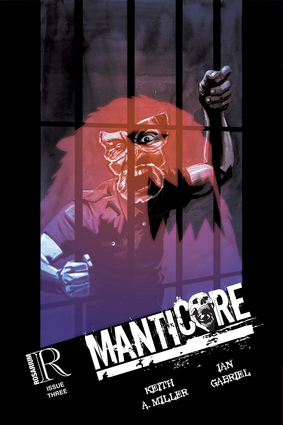 This brutal yet familiar life they’ve all grown accustomed to is about to come to an end as a mysterious stranger is transferred to their unit and these hardened inmates start to die… Horribly.One at a time.Manticore is a 5-part prison horror comic book series by the talented duo, Keith Miller and Ian Gabriel. Keith is the writer behind Triboro Tales, Insensitives, and the forthcoming Rat Ronin zombie tale, Infest. This is Ian’s first professional comic book title. Born in 1990, Ian Gabriel began his addiction to comics at the tender age of one with Batman: Year One. There is very little hope of his breaking that habit any time soon. Graduating from SUNY Geneseo with a Bachelor’s in Studio Art, he is breaking into the comic book scene where he hopes to build a fort with all the pages drawn from his projects.Ian is currently working with Keith Miller on their prison horror tale, Manticore. Keith A. Miller was born but not completely bred in Brooklyn, New York. When he’s not busy corralling thirteen-year-olds (he's a teacher), he writes independent comics. He likes to play around in the science-fiction and urban fantasy genres but is not above a good slice-of-life graphic novel. He is the co-creator of Triboro Tales and Insensitives. His latest graphic novella, Infest, will hit the convention floors in 2015. He is currently producing the prison horror tale, Manticore, for Rosarium Publishing.Miller is a graduate of CUNY Queens College, where he received a degree in Comparative Literature and Cultural Anthropology, and CUNY Law School. His interests lie in telling speculative fiction stories of people generally not represented in genre fiction so that the plucky character of color will not die first. He is currently working on his first novel. Born in 1990, Ian Gabriel began his addiction to comics at the tender age of one with Batman: Year One. There is very little hope of his breaking that habit any time soon. Graduating from SUNY Geneseo with a Bachelor’s in Studio Art, he is breaking into the comic book scene where he hopes to build a fort with all the pages drawn from his projects.Ian is currently working with Keith Miller on their prison horror tale, Manticore. Born in 1990, Ian Gabriel began his addiction to comics at the tender age of one with Batman: Year One. There is very little hope of his breaking that habit any time soon. Graduating from SUNY Geneseo with a Bachelor’s in Studio Art, he is breaking into the comic book scene where he hopes to build a fort with all the pages drawn from his projects.Ian is currently working with Keith Miller on their prison horror tale, Manticore. Keith A. Miller was born but not completely bred in Brooklyn, New York. When he’s not busy corralling thirteen-year-olds (he's a teacher), he writes independent comics. He likes to play around in the science-fiction and urban fantasy genres but is not above a good slice-of-life graphic novel. He is the co-creator of Triboro Tales and Insensitives. His latest graphic novella, Infest, will hit the convention floors in 2015. He is currently producing the prison horror tale, Manticore, for Rosarium Publishing.Miller is a graduate of CUNY Queens College, where he received a degree in Comparative Literature and Cultural Anthropology, and CUNY Law School. His interests lie in telling speculative fiction stories of people generally not represented in genre fiction so that the plucky character of color will not die first. He is currently working on his first novel. Keith A. Miller was born but not completely bred in Brooklyn, New York. When he’s not busy corralling thirteen-year-olds (he's a teacher), he writes independent comics. He likes to play around in the science-fiction and urban fantasy genres but is not above a good slice-of-life graphic novel. He is the co-creator of Triboro Tales and Insensitives. His latest graphic novella, Infest, will hit the convention floors in 2015. He is currently producing the prison horror tale, Manticore, for Rosarium Publishing.Miller is a graduate of CUNY Queens College, where he received a degree in Comparative Literature and Cultural Anthropology, and CUNY Law School. His interests lie in telling speculative fiction stories of people generally not represented in genre fiction so that the plucky character of color will not die first. He is currently working on his first novel.